The Star Trek: Prometheus trilogy represents a pretty significant milestone in Star Trek literature: the first time an original liscenced Star Trek story has been originally published in a language other than English. 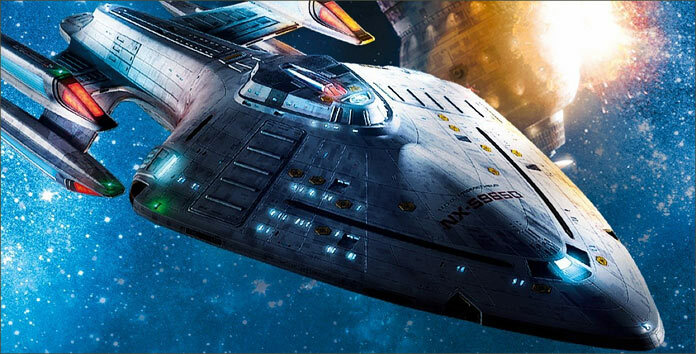 Conceived of by German publisher Cross Cult for the celebration of the 50th anniversary of Trek, the Prometheus trilogy featured the mission of Captain Richard Adams and the crew of the U.S.S. Prometheus into the Lembatta Cluster to confront a growing terrorist threat to both the United Federation of Planets and the Klingon Empire. To represent the Empire's interests, accompanying the Prometheus is the I.K.S. Bortas, former flagship of Chancellor Gowron, and commanded by Captain Kromm. 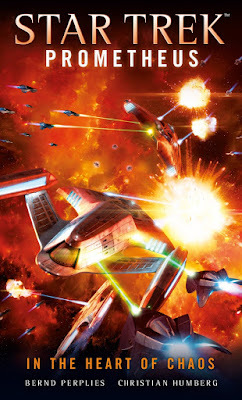 In this, the third and final novel, the foe that the Federation faces is becoming more apparent: the so-called "Son of the Ancient Reds" from the mythology of the Renao is all too real, and causing feelings of xenophobia, racism, and bigotry to bubble up to the surface for nearly everyone in the Lembatta Cluster. Star Trek fans might remember the "Beta XII-A Entity" from the TOS episode "The Day of the Dove," a non-corporeal being who fed on feelings of hatred and pitted the crew of the Enterprise against the Klingons led by Kang. The entity that Prometheus must confront is a similar one, but much more powerful. The Starship Prometheus confronts forces that threaten to tear Renao society apart. According to the ancient legend, the Son of the Ancient Reds was defeated by the "White Guardian," which turns out to be another energy being. Locating others of their kind, the Prometheus sets off to try to convince another being to battle the Son and free the Lembatta Cluster from its influence. However, they are unwilling to risk themselves, instead allowing Jassat ak Namur to carry some of their energy and use it to end the life of the Son. I enjoyed this part of the novel in particular as it allowed the Prometheus to leave the Lembatta Cluster and engage in a more "exploration" type mission while still serving the goals of the main mission. The Klingons also play an interesting part in the novel. Over the past two books, Kromm has been getting more and more aggressive, obviously also partially under the influence of the Son of the Ancient Reds. However, in this novel, we see a bit of a return to what I would call "good" Klingon behavior. At the end of the novel, I would say that Kromm comports himself quite well, and while he and his first officer never did see eye-to-eye, he once again becomes "honorable" in my eyes. Initially, I had issues with including Spock in this series, feeling that it made the universe feel very small. However, with this novel, I find myself having to eat my words. 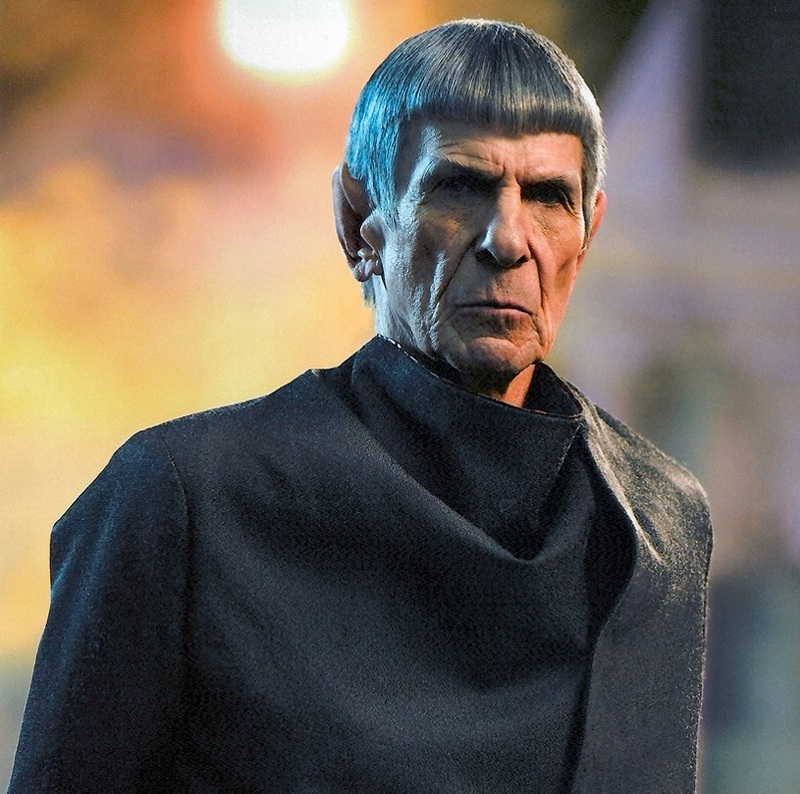 Spock's inclusion makes the story much better, linking it to the events of The Original Series, as well as providing some great moments with this classic character. I initially chaffed against the inclusion of Spock in these novels, but I found him to be an important part of the story when all was said and done. I've long said that one of the things that Trek does very well is provide a mirror for current societal issues, and in that respect, the Prometheus trilogy excels. Sometimes the parallels might be a bit "on the nose," but seeing issues like terrorism, xenophobia, racism, and the "alt-right" being explored in a Star Trek setting is definitely a good thing. In this novel, we see those issues played out through th eyes of the Renao, who are seeing their way of life destroyed by these issues. One particular story that's followed throughout the novel is the relationship between a father and son, with the son being radicalized by propaganda and, of course, the influence of the Son of the Ancient Reds. While in the case of the real world, our issues aren't being caused by a malevolent entity, Trek can still be a good forum for exploring these issues and presenting them in a way that might cause some of us to reflect on what is going wrong in the world and make changes for the better. I'm obviously not saying that a Star Trek novel will change the world, but if it sparks even one conversation that can nudge things in the right direction, it will have done its job. The conclusion to the novel was satisfying, but in some ways it seems to have ended a little too perfectly. I'm not saying that I wanted a tragic ending, but there is definitely a lot of "happily ever after" going on here. However, I do like where things are left and would most certainly not be opposed to seeing these characters again in the future. Perhaps another kick at the can with more Star Trek: Prometheus novels from Cross Cult? Or, barring that, incorporating some of the characters and situations into future Star Trek novels from Simon & Schuster would also be very welcome. In the Heart of Chaos and the entire Star Trek: Prometheus trilogy are worthy additions to the Star Trek universe. Humberg and Perplies have put together a fun crew with a lot of potential, and I'm genuinely sad that we may not see them again. I can only hope that the voyages of the U.S.S. Prometheus might continue in some way, shape, or form in the future. It was certainly an interesting take on the novelverse, and I'm sure the authors have some ideas about where to take things from here. If you're interested in hearing from one of the authors, please listen to episode 253 of the Literary Treks podcast, in which Bruce Gibson and I spoke with author Christian Humberg about this novel and the trilogy as a whole. Find the link below! The first book of the New Earth miniseries: Wagon Train to the Stars by Diane Carey.